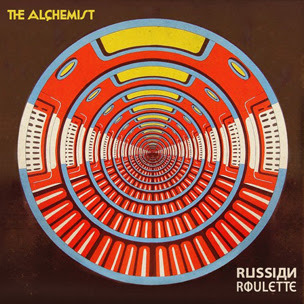 Russian Roulette, the latest release from The Alchemist, is not your typical hip hop. For this journey, Alchemist passed on rhyming (thankfully) and went into crate digging mode: finding rare records and dusty samples, creating funky loops, and sprinkling enough lyricists throughout Russian Roulette to create a unique experience. Off tops, this album is not going to be everybody’s thing. If you know about the works of: Kid Koala, Madlib, Exile, Oh No, or DJ Q-Bert, then you can begin to imagine what Alchemist laid down this time around. If you have no clue and feel adventurous, then jump in. This album is more of a whole creation rather than the average release with 15 individual tracks. Russian Roulette is 30 tracks deep but is only around 45 minutes long. While there are definitely tracks that stand out on Russian Roulette, this album was designed to be played from beginning to end. The way each track flows from one to the next, Russian Roulette plays like a random radio station in the middle of nowhere (or Russia, I’m guessing from the title). While there is a lot going on, you consistently keep hearing things to keep you interested. This is one of those albums where every once in a while you hear something that makes you press rewind because you can’t believe what you just heard (Check for the typewriter……you’ll see what I’m saying). In honesty, the album does veer off into some ….different territory at points, but if you commit to the whole listen you get taken by surprise when a dope beat or a particular MC stands out. If you still buy physical copies of CDs, the inside of the cover has artwork that correlates to each of the tracks, which is actually pretty cool. At points where you get lost in what Alchemist is laying down, along comes an MC that brings it back to keep you hooked until the album’s end. With features from: Guilty Simpson, Evidence, Roc Marciano, Action Bronson, MiDaz, Danny Brown, FaShawn and Schoolboy Q and others, it is easy to see why there are tracks that roll through that might have the tendency to catch you off guard the first time you listen to this album. The tracks that are music and loops should not be dismissed by any means. It is a careful construction. I know that sounds nerdy but I can’t say it any other way. Hearing this side of Alchemist makes me wonder what other creations he may have waiting. This is definitely an album you put on while you are on a road trip or chilling at home. After a few plays you will have favorite segments (right now mine are Flight Confirmation, Training Montage, and Oleg’s Fight) and segments you can do without sometimes. Overall, Russian Roulette balances instrumentals and lyrics for an auditory journey you won’t mind taking when you just need to get away for a little while.